180 sqm villa with a 1 800 sqm garden including private pool. 35 kms from Saint Tropez. Outstanding view over the Mediterranean sea and the 'Iles d'or'. 150 meters walk to the beach. Beach access is restricted to people living in the domain. Guard dedicated to the domain (23 houses). Domaine de La Ris is a private domain, within domaines du Cap Bénat. Access is strictly restricted to owners and guests which makes it very safe and uncrowded. 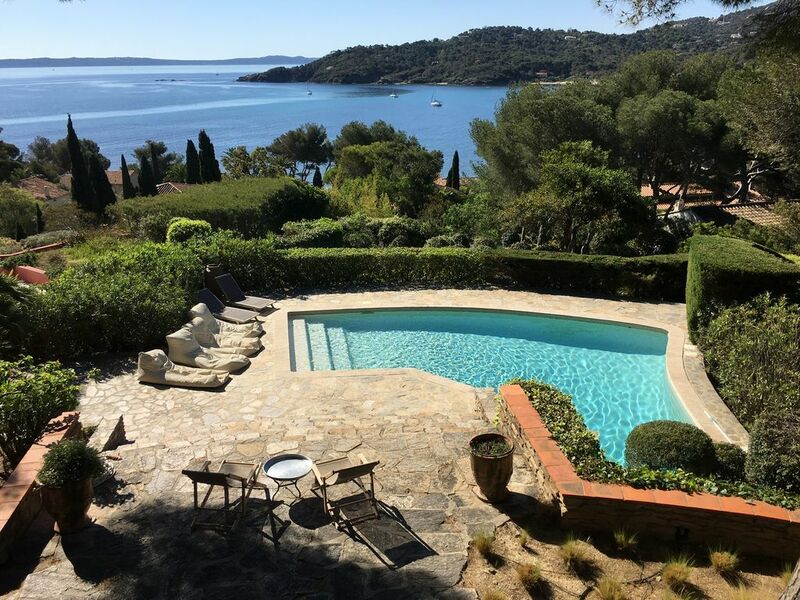 Enjoy relaxing holidays in a very exclusive and quiet place but just a few miles away from the hot spots of the Cote d'Azur (Le Lavandou/ Saint Tropez). 2 large independent bathrooms with baths and bidets adjacent to the 2 large bedrooms and 2 small bathrooms in the 2other bedrooms with washbasins and bidets. 2 additional showers have been created in 2015 on the verandas of 2 rooms with an amazing view. 4 toilets. 1 shower with access from outside. Very convenient when coming back from beach or pool. 2 large independent bathrooms with baths and bidets adjacent to the 2 large bedrooms and 3 small bathrooms in the 3 other bedrooms with washbasins. 4 toilets. The perfect family holiday in outstanding and exclusive location in the French Riviera. As said in previous comments, the domain is totally private and safe for children while being close to Bormes les Mimosas and Le Lavandou with amazing sight seeing spots, fantastic beaches, plenty of shops and top notch restaurants. Location is ideal w/ superb panoramic view, nice swimming pool and large garden. It is only 2 min walking distance from the private beach. Tennis courts nearby. House is super functional with newly refurbished kitchen and nearly 1 bathroom or shower per room! Some parts are newly renovated which is a plus, while keeping the charm intact. All rooms have cool view on the sea or neighboring garden. We really recommend this location. We will be back for sure ! We stayed at La Griotte 3 weeks and really enjoyed it. The domain is totally private though close to Bormes les Mimosas where one can choose between some very good restaurants. It's an ideal place for children as the beach (private) is 2 minutes away and the pool is perfect. The domain is safe and secure (special thanks to Anne and Jean-Claude for their kindness and availability). Also some of the most beautiful beaches on Cote d'Azur (Estagnol, Cabasson) are 15 min by car. The only negative point was that the house needs some refreshments. Although we barely cared about as the rest was perfect. My children, wife and I were delighted by this lovely house. The view, location and climate were wonderful. The house has the feeling of a lovely family home with many antiques and is very carefully decorated. We recommend it to all friends who wish to spend some peaceful time in the South of France in a really enchanting family retreat. It is nice to find a house with character rather than the usual all white super design, but charmless, modern villa. We stayed in the villa for two weeks in August 2009 with my wife and 3 kids. The house is located in a private domain with 24/7 protected access : we loved it that the kids were totally safe to go play around, build tree huts... Besides, the neighbouring villas are also houses with children, so they could make some friends and all hang out together. The private beach of the domain is only 2 steps away from the house and the walk to reach it is just lovely. We also enjoyed the facilities within walking distance of the house: half a dozen tennis courts, a beach bar which is also a sailing school/ windsurfing club, a little supermarket during summer. The house is bright, colourful and comfortable. It is surrounded by pine trees : the kids would love picking up pine nuts ! For the record, four rooms out of five offer a magnificent view on the sea, the Levant Island and Port-Cros, but the panoramic view from the master bedroom is particularly breathtaking. Spending our holidays in this family home was a real bliss and we do intend to come back soon! It is a lovely place to stay: the view is outstanding, the garden is charming, within a quiet and perfumed surrounding. I cant forget the view from the bed ! La Griotte is a very special family holiday house set within an extremely peaceful private domain with wonderful views to the sea and islands. Its a 1920/30's house with spacious rooms (pastel painted - pinks/greens/blues - think Marrakesh upstairs) , a good sized garden, and pool. The location is excellent - near Bormes, child friendly beaches, and within easy distance to airports. But the house itself is very tired, unclean and requires modern features such as air conditioning in the bedrooms. Paint is flaking from the walls downstairs due to internal damp, whilst the moisture is producing an odour. The kitchen equipment is old and not clean, rugs both upstairs and downstairs are filthy. Baths are old, again with peeling surfaces. Additionally there are many family items, curios and antiques that both add character but crowd surfaces. Not easy for children. The house gets very warm during the day and only one bedroom has air conditioning. As there are plenty of mosquitoes its best to take mosquito nets for cots and buy plenty of mosquito coils/tablets. The terrace is splendid for al fresco meals, but there appears to be no gardener, so was covered in pine needles and leaves (we swept it clean). There are also several broken tiles on the steps down from the house which are a hazard (very sharp). The pool is superb, not large, but a great position catching the sun and cooling breeze. Note that there is no proper pool fence - rather an electronic alarm - not brilliant for small children. The "guardian" of the domian rigged up a temporary fence - again pretty poor. You need to keep a close eye on small children at the house. Linen is an additional amount, but is of a very poor quality, and don't expect a change of linen, tea towels, childrens cots linen or made up beds on arrival. Cot and high chair costs are additional. Note that there's no outdoor BBQ. One can walk to the bay below the domain, but the beach is not that wide (5m) and is not cleaned until the 1st July. You'll need to drive everyday to obtain breakfast. Following the guests comments, I have changed the cleaning woman, bought new kitchen equipement and the gardener now comes to get rid of pine needles. This has resulted in following guests very happy during the rest of the summer. Bormes les Mimosas is 20 kms away from Toulon Hyères (international airport) and 35 kms away from St Tropez. Picturesque village of Bormes les Mimosas is just 2 kms away. Golf: A lot of golf courses in the department ( Var).